It was early in the morning, still dark outside, and Gretchen Whitmer had a certain magazine interview to get to. She didn’t want to wake her teenage daughter, Sherry, but she hoped to sing “Happy Birthday” to her 16-year-old. She did both—woke her and sang. Later she would “get the skinny” attending parent-teacher conferences at the East Lansing school attended by Sherry and sister Sydney, 14, and then take the birthday girl to get her driver license. “I think the thing that keeps me grounded and focused on what really matters is my kids and my family,” she said. Whitmer is running a tireless campaign to be Michigan’s next governor. She was the unanimous pick of MEA’s Statewide Screening & Recommendations Committee, and she has since garnered nearly every other union endorsement for her record of championing organized labor. The Michigan Democratic primary election is Aug. 7 this year. Given the pace of her days, she knows a lot about the pressures faced by moms, “whether you’re a paid working mom or a mom working at home,” she says: Breakfast made, lunches packed, dinner in the Crock-Pot before most people have gotten out of bed. She understands the demands of caring for a family amid other stressors, including tending to the needs of aging parents at the same time. She was the primary caregiver for her mother until she lost her battle with brain cancer just a few months after Sherry was born. Topping her education to-do list is to restore education funding and protect it from being raided to bail out other parts of the budget. “The states that are turning around educational outcomes for kids are the ones making a meaningful investment in children,” she said. The lawmakers who currently control both houses of the Legislature don’t ignore all voices, she said. “The Republicans in Michigan work for one family: The DeVos family. That is who sets policy for my kids’ schools and for the schools your members are working in day in and day out. The daughter and granddaughter of educators, Whitmer sees damage from years of attacks on educators’ pay and benefits, in addition to the silencing of expert voices on education policy. Among the destructive policies championed by DeVos and other wealthy special interests, unlimited for-profit charter schools have drained tax dollars out of traditional public schools that continue to educate 90 percent of students. Approximately 70 percent of for-profit charters perform in the bottom half of school rankings. Whitmer wants to close poor-performing charters. If necessary, she would pressure universities that authorize those charter companies. “A governor with a backbone can use the power of the state budget to force the closure of charters that are failing our students,” she said. Campaigning around the state, Whitmer has heard in every city, town, and rural crossroads from educators frustrated by politicians’ disregard for their knowledge, expertise, and well-being. However, she got the “political bug” while doing internships in college and followed that interest into policy work for a time. She decided to pursue law school hoping it would offer flexibility and opportunity, and that is when she discovered her passion, she said. In 2012, she became the first woman chosen by her colleagues to serve as Democratic leader in the state Senate. That year, she bolstered a reputation as a fighter during the battle over “Right to Work” legislation. 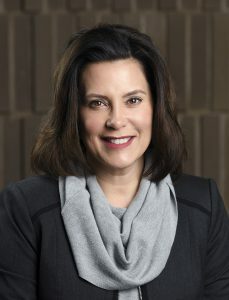 Strongly opposed to the attack on organized labor in the birthplace of unionism, Whitmer crashed a closed Snyder press conference after he stopped returning her calls to explain his sudden turnabout on the issue. Whitmer also voted against the law to allow the state to deduct 3 percent of school employees’ pay to fund retiree health care. Last December the law was declared unconstitutional by the state Supreme Court after a nearly eight-year legal fight by MEA, AFT Michigan and AFSCME. That is why the union matters, she says. And it’s why this election is vital.